All across the United States family and friends will gather together on Thursday for fellowship, fun and food. This is because the third Thursday of November is celebrated as Thanksgiving Day. There are several other countries that take time during the year to pause and give thanks for all of life’s blessings. Of course, Thanksgiving Day in America is set aside to give thanks to the Lord for all of the blessings He has bestowed on us throughout our 200+ years of history. Unfortunately, the true meaning of Thanksgiving Day has been lost in the busyness of football games, travel and, of course, Black Friday sales gimmicks. As with most Christian holidays in America, Thanksgiving Day has succumbed to the secular culture. 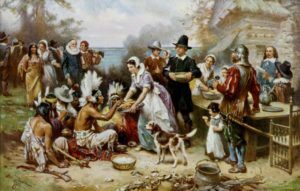 In fact, some secular history textbooks present the first Thanksgiving as a time when the Colonists met and gave thanks to the Indians for their help as they settled in the New World. God is completely ignored. Even though it is good to take one day each year to give thanks to the Lord for all of His rich blessings on our lives, thanksgiving should be a way of life for the Christian. It isn’t supposed to be something we just do on a national holiday. Paul makes this clear in many of his letters in the New Testament. Two specific verses come to my mind when I think about being thankful for what God does for me each and everyday. Recently I sat down and started thinking about how much God has done for me over the course of my life. Let me share a few of the things for which I am thankful to God. Sad to say, there are too many days that I allow the urgent to take control of my life and I find myself not consciously being aware of the tremendous price God paid for my salvation. It goes beyond any human comprehension that the Creator of the universe would give His only Son as a ransom for my sin debt. When I think about what Christ did for me by laying down His life to redeem me out of sin, it continually amazes me. It is my desire to never take my salvation for granted but to give God thanks each and every day for this precious gift. Next month my wife and I celebrate 50 years of marriage. Like every marriage, there have been those rough days through which we had to navigate. But God blessed me with a godly wife who has supported me in everything that God has led me to do. God also has blessed the two of us with three wonderful children, their spouses and six fantastic grandchildren. Again, it hasn’t always been smooth sailing but 3 John 4 is so true — There is no greater joy than to hear that your children walk in truth. I thank God everyday that my three children are walking in truth today. Sometimes we fail to take time to thank God for the people that God brings into our lives to guide us in the paths He wants us to walk. I have been overwhelmingly blessed by several pastors who have taught me truth that equipped me for life and ministry. Spending 16 years under the preaching and leadership of Dr. Jerry Falwell taught me what true faith in God is and how to live by faith each day. Then sitting under the teaching of Dr. James Merritt and Dr. Glenn Weekly took be deeper into the truths of Scripture. I also had the privilege to serve with Dr. Michael Catt for nine years at Sherwood Baptist Church. God used Michael to teach me the importance of prayer in my daily life. I have also been blessed by the friendships that I have forged with Pastor Mike Lewis at Cathedral of Praise and Pastor James McMenis at Word of God Ministries. These two men have provided me with biblical counsel and guidance so that my life and ministry would stay focused on Christ. God has truly blessed me by allowing me to sit under the preaching of such godly men. One day is not enough to thank Him for providing me with these ministers of God’s Word. I have also been privileged to serve under and glean from several Christian educators who helped me form a biblical worldview and biblical philosophy of life. I probably would not have survived being a school leader if it weren’t for the guidance and instruction that I received regularly from Dr. Roy Lowrie, Dr. Jack Layman, Dr. Tony Fortosis, Dr. Gene Garrick, and others. These men had gone through the trials of leadership and were a source of encouragement and always provided me with a model for what Christ-like, servant leadership looked liked. A special note of gratitude must go to Dr. Paul Kienel. He had the courage to take a young Christian school administrator and give him the opportunity to serve Christian schools in 8 Southeast states as Southeast Regional Director of ACSI. Much of my understanding of kingdom education resulted from Dr. Kienel’s exhortation for me to present a biblical philosophy of education to others. Again, one day a year is not enough time to thank God for these and other mentors that He has brought into my life over the years. I have to start by saying that Kingdom Education Ministries really isn’t my ministry — it is His ministry that He allows me to be a part of. If it were not for God’s leading me that took me to LifeWay Christian Resources, my book, Kingdom Education, would never have been written. It blows my mind how this little book has been used all around the world to challenge parents, church leaders and Christian educators to follow God’s plan for educating future generations. Anything I may have been able to accomplish in proclaiming this message to others is due only to the grace of God. I fully understand the meaning of Jesus’ words in John 15 where His said, without Jesus I can do NOTHING! Who are my encouragers? They are those who receive and read this blog each week. YOU are one of my encouragers and you do not know what a tremendous blessing you are are to me as you read and share my weekly ramblings with others who want to provide a biblical worldview education to as many children and youth as possible. There is not a day that goes by that God doesn’t bring to my mind a school leader, a pastor, teacher or fellow laborer in ministry that I have had the privilege of serving and getting to know. You are in the trenches doing the “grunt” work of putting kingdom education into practice and for that I am eternally indebted and grateful. I could go on and on listing things for which I must daily give thanks to God. However, my point for doing this is to encourage all of us to always be thankful for God’s blessings on our lives. No matter what you and I may face, the truth is that God is at work to make all things good for His glory. If you live where a specific Thanksgiving Day is observed, by all means take the time to give Him the praise He deserves. But more importantly, in every thing give thanks: for this is the will of God in Christ Jesus concerning you. Have a blessed week! Thank you so much for your post, they really encourage me as a Christian school Director. Thank you sir. Happy Thanksgiving Glen. Thankful for our “new” relationship. You are an inspiration. Thank you for the reminder. So often I do get caught up in the busyness of stuff/life and take for granted the things/people I’m thankful for. I’m thankful for you, Sir and I appreciate all the countless hours you’ve sacrificed, all for the Glory of God. I give thanks for you Glen and this ministry. Your testimony, your passion for Christ and your heart for children have brought exceeding gratitude to our great God. First Academy of First Baptist Church,in Douglas, Ga is thriving and growing. You helped pioneer this ministry through your book and speaking engagement. Thank You! Thank you! I have been involved as 3 of my grandchildren attend and my daughter-in-law is a middle grades teacher. Now I’m serving on the school’s board. FA is 5 years in now and have grades PreK-8 ! We are also partnering with Renewanation this year as our plans are to eventually add High School. To God be the glory! Rejoicing with Thanksgiving! Happy Thanksgiving and Happy Anniversary! A paradox of the human condition is that the more we possess, the less we feel or express genuine gratitude. In an affluent society like ours, a spirit of entitlement flourishes and angry demands for more too often replace expressions of thanks – especially if the ultimate source of human blessing has been rejected. It’s a challenge for us North American believers too. We need to consciously discipline ourselves in daily thanking the Lord for specific blessings. Paul addressed the spirit of ingratitude 2 millenia ago.”For although they knew God, they neither glorified Him nor gave thanks to Him”, says Romans 1:21. Some of the results of ingratitude for ancient cultures are mirrored in our own, “Therefore God gave them over in the sinful desires of their hearts, to sexual impurity and the degrading of their bodies with one another. They exchanged the truth of God for a lie and worshipped and served created things rather than the Creator”. It turns out that regularly expressing thanks to God isn’t only an important aspect of our worship, it’s for our own good too! So thankful for this ministry and your faithfulness! Thanks for the reminder! Thank you for your faithful example and leadership over the years and for your passion for Kingdom Education. You continue to serve as a wonderful role model for all of us! Blessings to you and your whole family.